The Eggers family referred to the front bedroom as the Drummer Room. “Drummers” were traveling salesmen who made their business calls on the store (they “drummed up” business) and would require lodging and joined the Eggers family at meals. At various times, seminary students serving Salem church also worked as school teachers and stayed with Eggers family. 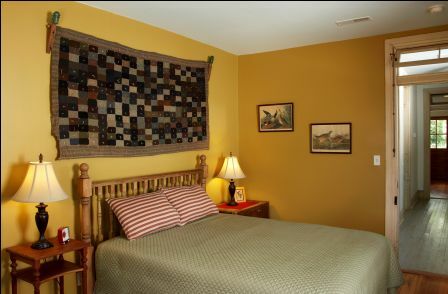 The “drummer quilt” hangs above the bed. It was made by Ella from obsolete fabric swatches for men’s suits. The drummer sample cases above the wardrobe remain in tribute to the salesmen who spent the night and joined the Eggers family at the table for meals. The Drummer Room features a queen size bed and private bath with a shower.